Cardiff City manager Neil Warnock believes Brighton & Hove Albion's 5-0 defeat to Bournemouth has made things harder for his team ahead of tomorrow's Premier League match. The Seagulls crashed to a 5-0 home defeat against the Cherries on Saturday but remained five points ahead of third-from-bottom Cardiff, who lost 2-0 at Burnley. 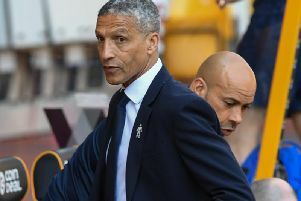 Warnock expects Brighton's players to respond from the weekend hammering and said: “If anything that’s made it harder for us. “There will be a response from the players. They’ll be hurting after that performance. “They’ll have had a bad night but not as bad as me because we’re five behind them. At this level you can lose four or five on the trot quite easily when you’re at the bottom of the league. Warnock added both teams know the importance of the game: “I think it’s down to us. They know how important it is and so do we. “The crowd will be up for it. I imagine we’ll be taking our full allocation and it will be a good atmosphere. “It’s a nice place. Nice part of the country. It’s a good club and well-run club. Glenn Murray is likely to lead the line for Brighton tomorrow and Warnock admits his biggest regret at Selhurst Park was allowing the striker to leave for Reading on loan. He said: “He’s just a good player. A good pro. “When I was at Palace my biggest mistake was letting him go on loan. “He was pleading with me because he wasn’t getting a game before I went and I never saw enough of him.